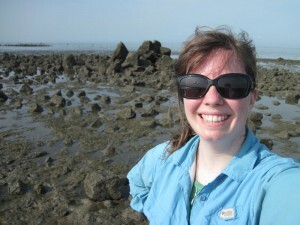 A marine invertebrate biologist in her natural habitat, the rocky intertidal. Playa Venado at Veracruz, Panama. Picture this: Reading week. Tropics. Panama. You’re probably imagining sandy beaches, palm trees, dense forest, a canal. And if this were a regular trip, you would probably be right. But this is a field trip. And while a field trip for me does in fact mean a trip to the beach, it is one that involves wearing long pants and a long shirt, a big hat, dive boots, a cooler full of collecting gear, and being covered in mud. This is the fun part. Field work also means finding funding to go to the field, stressing over getting permits, organizing equipment, going out with the tide, hoping you get what you are looking for and then spending more time in the lab to process everything than you do collecting it in the first place. This is slightly less fun. I decided to go back to Panama one more time (I have given up on saying it is the last time). I have a project that involves seasonal effects, the dry season is here, the tides lined up with the reading break, and most importantly I had money to travel thanks to the generosity of my department. I’ve been to Panama plenty in the rainy season, but not in the dry “summer” season, which brings strong trade winds that blow the surface waters offshore, bringing cooler, nutrient rich water to the surface. As a result, marine animals experience very different conditions at this time of the year, which may have an effect on the development of the snails that I work on. Plus, I needed more animals in Montreal to keep working with live material. I will also admit that coming to Panama was a good excuse to escape winter. Even better, this means that I get to see all of the lovely people that I know in Panama. My friends and colleagues in the NEO program are all much smarter than me, and organize their time so that they spend the cold winter months in Panama, enjoying summer and fall in Montreal. I’ve always done it backwards, and this is one of the few times I’ve been down here while there is snow on the ground. Unfortunately, a two week field trip is very little time. I’ve been busy, busy, busy; even more than usual. A couple of days to acclimatize to the heat and get administrative things in order, then it’s out to the collection site. Doing marine work from the shore means that you are dependant on the tides. Unfortunately, the tides don’t consider my usual sleep schedule, or my preference not to be in the sun at midday. But that’s when intertidal life is accessible, so that’s when you go. The biggest challenge (once you have permissions to collect animals and to take them out of one country and into another) is then to take everything you’ve collected and get it ready to take with you. Individual animals aren’t too much work. However, spending the four to days in the field means you could have a hundred animals (and thousands of embryos!) and they all need to be prepared for travel. I’m carrying both live and preserved animals with me. That means the live animals have to be comfortable, and the preserved ones have to be preserved. Which is a lot of work. Each batch of eggs has to be sorted, and because I want to use them both to count embryo types and for other morphological analyses, they have to be preserved in such a way that they will be useful for many things. And I am working on another project that requires another protocol so that I could look at it under the scanning electron microscope here in Panama. There were very few nights that I didn’t come home late and tired, either from collecting or from lab work. And not enough nights coming home late and tired from visiting with my friends! At this point, I’m hoping to be able to take my last days here off to enjoy the beach without having to look under rocks for flat, mud coloured snails. But it’s not looking likely. I won’t even start thinking about how much more time I will have to spend looking at these same embryos again once I arrive in Montreal. At least the lab will be warm, even if it is still snowing outside! Previous Post Formatting: An unexpected challenge of thesis-writing!